Cumbria is a large county in North West England and contains the Lake District and Lake District National Park. It is bounded to the north by the Scottish Borders, Dumfries and Galloway, to the west by the Irish Sea, to the south by Lancashire, to the south east by North Yorkshire, and to the east by County Durham and Northumberland. Cumbria is very mountainous containing every peak in England over 3,000ft above sea level, with Scafell Pike being the highest at 3,209ft. The Lake District is one of England’s most beautiful Outstanding Areas of Natural Beauty attracting mountain climbers, hikers and walkers, cyclists, runners and tourists from all over the world and holds a source of inspiration for artists, writers and musicians. Cumbria consists of six districts Eden, Carlisle, Allerdale, Copeland, South Lakeland and Barrow-in-Furness. Lancashire is a county in the North West of England bordered by Cumbria to the North, North and West Yorkshire to the east, Greater Manchester and Merseyside to the south and to the west the Irish Sea and Morecambe Bay. Its main city is Lancaster, The Red Rose of Lancaster is the county flower and the Duchy of Lancaster is one of two remaining royal duchies in the UK. Lancashire, once known as the Workshop of the World, was the birth place of the Industrial Revolution and between 1750 and 1850 transformed the life of England. The county is associated with cotton and it was here that major advancements were made in the production of cotton. Coal was also needed and mining flourished. Lancashire is steeped in history and heritage so there is something for everyone from witches and ghosts to towers and castles, myths and legends to fables and folklore, churches and sacred sites to halls and houses, walking and cycling to rivers, canals and waterways. It is also a place for wildlife and bird watching the Forest of Bowland covers 312 square miles of unspoilt countryside of rural Lancashire and adjacent Yorkshire. The county also has literary links Sir Arthur Conon Doyle, the Bronte sisters and JRR Tolkien. Lancashire is home to Blackpool one of the UK’s favourite seaside resorts attracting millions of visitors to the Pleasure Beach, Sandcastle Waterpark, Blackpool Zoo, Blackpool Tower the Illuminations and an all year round calendar of events. The River Lune is a river in Cumbria and Lancashire. The source of the river is at the confluence of Sandwath Beck and Weasdale Beck near Ravenstonedale in Cumbria and flows for 44 miles before entering the Irish Sea at Plover Scar near Lancaster in Lancashire. The valley of the River Lune is split into three parts its northern part between its source and Tebay is called Lunesdale, below this is the spectacular Lune Gorge then below the gorge the valley broadens out into Lonsdale. The River Lune, now tidal only below Skerton Weir in Lancaster, is fed by its many tributaries which drain the north west of the Yorkshire Dales and the northern Forest of Bowland and is one of the most important salmon rivers in the country. Kirkby Lonsdale is a historic market town in the South Lakeland district of Cumbria. The town is situated on the banks of the River Lune in the idyllic Lune Valley and provided inspiration to artists such as Constable and Turner. Its market square is surrounded by 18th century buildings and stone cottages and some rather quaint cobbled courtyards and narrow alleyways, with wonderful names such as Salt Pie Lane and Jingling Lane. In 1227 Kirkby Lonsdale gained its market charter and its right to hold an annual fair every September. By the early 19th century the market, which was held in the church yard, had created a busy thoroughfare of daily drovers and packhorse carriers which caused the market area to get very congested so a new market place was built in its current position in 1822. The monument in the centre of the Market Square was built at the same time. The town once had twenty-nine inns and ale houses to cater for the thirsty travellers but today only eight of them remain and the market is still held every Thursday in the Square. Parking is not permitted in the Square on market days. The Norman Church of St Mary set in a primary position in Kirkby Lonsdale provides superb views over the River Lune known as Ruskin’s View after John Ruskin, a poet and philosopher, who described it as “I do not know in all my own country, still less in France or Italy, a place more naturally divine”. Ruskin’s View was painted by J. M. W. Turner. Kirkby Lonsdale’s Railway station which opened in 1861 closed to passengers in 1954. During the first week of September the town hosts a Victorian Fare now a major event and a lively Victorian street atmosphere is achieved with entertainment, demonstrations and street vendors. Kirkby Lonsdale has now become a very popular tourist place with so much to see and do. Devil’s Bridge is a Scheduled Ancient Monument over the River Lune on the outskirts of Kirkby Lonsdale dating from around 1370. It was built of fine grit stone ashlar and has three spans. The bridge, as with many bridges of the same name, is associated with a legend of the Devil that appeared to an old woman. He promised to build a bridge, so she could reach her cow on the other side of the river, in exchange for the first soul to cross over it. When the bridge was finished she threw bread across the bridge and her pet dog chased after it therefore outwitting the Devil and saving her own soul. The section of river underneath the bridge is popular with scuba divers because of the easy access and egress, deep rock pools of about 16ft during a low swell and good visibility. It is also popular with tourists and locals for picnicking, paddling or swimming in the summer and is a regular meeting place for motorbike enthusiasts on a Sunday morning. Devil’s Bridge is a name given too many bridges, mainly stone or masonry arch bridges, and represent a significant technological achievement. Each of the Devil’s Bridges has a corresponding Devil related myth or folktale and the legends about them form a special category in the Aarne-Thompson classification system for folktales. Whittington is a small historic village in Lancashire in the heart of the stunning Lune Valley with traditional stone built Cumbrian cottages and the church of St. Michael stands high up on the brow of a steep hill where it has stood since 1200AD covering the ruins of an ancient motte and bailey castle. Whittington is one of a cluster of settlements along the Lune Valley each with evidence of a motte. The village is also home to the Dragons Head pub and the Vale of Lune Point to Point races. The races first took place in 1936 and the course side car park with outstanding scenery and a breathtaking back drop of rolling countryside is ideal for picnicking and to while away the afternoon. 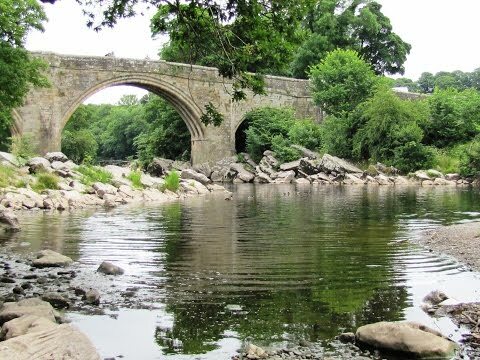 Whittington is close to Hutton Crags Nature Reserve and Kirkby Lonsdale. Lune Valley Ramble is 16.5 miles long linking the City of Lancaster with the market town of Kirkby Lonsdale. The route, waymarked by fingerposts and discs, follows the lower reaches of the River Lune making the most of the valleys idyllic and tranquil settings through woodland and meadows. It passes through some of the North West’s wonderful lowland countryside surrounded by high moors, lime stone hills, and overlooked by the distant peaks of Ingleborough, Whernside and Leck Fell. The route which can be combined with other waymarked trails also passes some picturesque villages and hamlets, historic castles, ancient churches and nature reserves. There is also an abundance of wildlife. From the car park we head forwards to Devil’s Bridge (optional: firstly we walk into Kirkby Lonsdale following the River Lune on the right for a look round). We walk over the bridge and take the path down the steps signposted Whittington. We bear slightly right across the park area with picnic tables to the road, A65. Cross straight over the road and head forwards across the field to the buildings. We go between the two buildings and cross straight over the road, B6254. We now head uphill keeping the wall and the wood on our left and following the yellow markers and a sign to Wood End. Go over the brow of the hill and head forwards towards Wood End. We go through the stile in the wall on the left at Wood End then turn right onto the farm track towards the white building of Wood End Cottage. We turn left in front of the cottage down a narrow little path between a wall and a hedge signposted Sellet Mill. The path broadens out and we cross a stream which merges with the path, a little further down the stream flows to the side on our right. We come out at the mill and turn right over the stile between two gates at the signpost and head forward keeping to the fence on the left. At the end of the buildings we turn left through a yellow marked gate and walk straight forward over the field to go through another gate and immediately over a small stream then turn right. We head forwards under a row of pylons keeping to the hedge on our right. We go over a stile on the right then bear left round a wooded area. We turn right close to a fenced driveway then on to the corner of the field to cross a stile. We turn left and follow the lane to Whittington. At the t-junction turn left then right to enter the churchyard. Keeping the church on our left we walk round to the church entrance and turn right down the steps to go through a gap stile. We bear left to go through a gate and head forwards through the field. We go down a passageway then turn right onto the road and head forwards through the village passing the village hall, the Dragons Head pub and the old post office. At a sharp right bend at the end of the village we turn left along a track passing a farm and tennis courts. We keep following the track between the fields to go through some gates and over two cattle grids then bear left to the River Lune. We now follow the river on the Lune Valley Ramble back to the bridge on the A65. We go through a gate and up the steps to the left of the parapet then cross the road and drop down the other side to cross the park area at the start of our walk. We turn right over Devil’s Bridge and back to the car park. This is a nice easy walk on public footpaths, minor roads and alongside the River Lune on the Lune Valley Ramble. Elevation: Approx lowest point 34.2m (112.2ft) Approx highest point 102m (334.6ft). Approx 5¼ miles allow 2 hours using OS Explorer Map OL2, Yorkshire Dales Southern and Western areas. Start point: Car park on the left of A683 just before the junction with the A65 opposite Devil’s Bridge. Kirkby Lonsdale is in the Southern Lakeland District of Cumbria. From the A1(M) take junction 51. At the roundabout take the first exit at the second take the second exit. At the t-junction turn left into Bedale. At the t-junction turn right onto the A684 to Leyburn. At the mini roundabout in Layburn turn left staying on the A684 through Aysgarth and Hawes to Sedbergh. After passing through Sedbergh take the left turn onto the A683 to Kirkby Lonsdale. Car parks are on both sides of the road just before the A65 at Devil’s Bridge. To park in Kirkby Lonsdale town turn right onto the A65 then right for the town centre. Parking: In Kirkby Lonsdale centre and at Devil’s Bridge both sides of the road (A683). There are public toilets at Devil’s Bridge and also at Jingling Lane in Kirkby Lonsdale. For refreshments in Kirkby Lonsdale there are shops, cafes, take-away, pubs and restaurants and in Whittington there is a pub the Dragons Head which doubles as a post office. At Devil’s Bridge there are usually two vans one selling ice-cream and the other drinks and snacks.